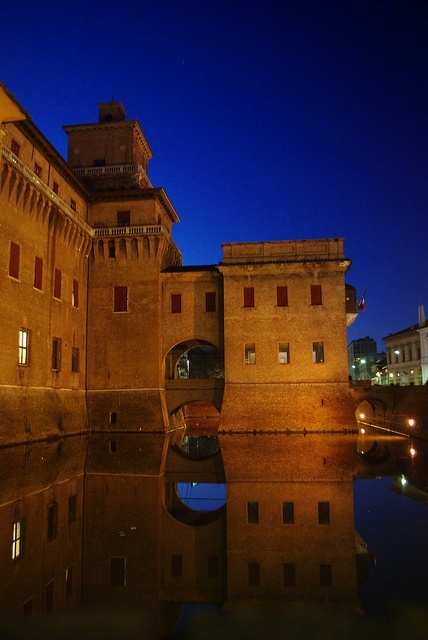 The Castle Estense or Castle of Saint Michele is a moated medieval structure in the center of Ferrara, northern Italy. It is a large block with four corner towers. On the outside, the castle essentially presents the appearance given to it by Girolamo da Carpi in the second half of the 16th century. Surrounded by a moat, it has three entrances with drawbridges fronted by brickwork ravelins. The fourth entrance, to the east, was sacrificed to make room for the kitchens. At the bottom, the appearance of the building still recalls a mediaeval fortress, but higher up, da Carpi replaced the battlements with elegant balconies in white stone, making it higher again by constructing a higher storey, covered by a skew roof. The towers were improved and made more graceful with roof terraces. The courtyard, nowadays fairly austere, was frescoed. In particular, at the top were portraits of all the ancestors (real and legendary) of the Este family: the only ones surviving, considerably damaged but still discernible, have been detached and placed under the portico on the east side of the courtyard.